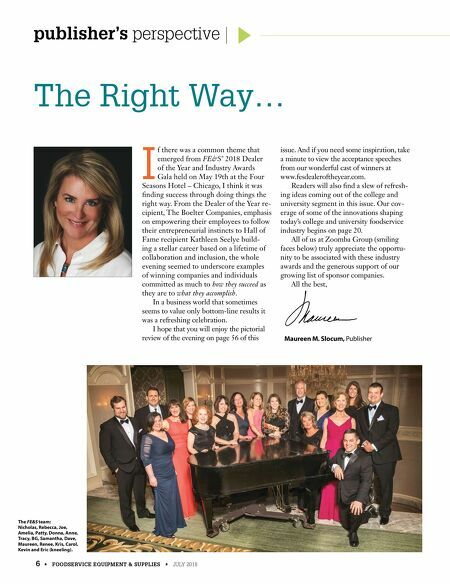 publisher's perspective 6 • FOODSERVICE EQUIPMENT & SUPPLIES • JULY 2018 The Right Way… I f there was a common theme that emerged from FE&S' 2018 Dealer of the Year and Industry Awards Gala held on May 19th at the Four Seasons Hotel – Chicago, I think it was finding success through doing things the right way. From the Dealer of the Year re- cipient, The Boelter Companies, emphasis on empowering their employees to follow their entrepreneurial instincts to Hall of Fame recipient Kathleen Seelye build- ing a stellar career based on a lifetime of collaboration and inclusion, the whole evening seemed to underscore examples of winning companies and individuals committed as much to how they succeed as they are to what they accomplish. In a business world that sometimes seems to value only bottom-line results it was a refreshing celebration. I hope that you will enjoy the pictorial review of the evening on page 56 of this issue. And if you need some inspiration, take a minute to view the acceptance speeches from our wonderful cast of winners at www.fesdealeroftheyear.com. Readers will also find a slew of refresh- ing ideas coming out of the college and university segment in this issue. 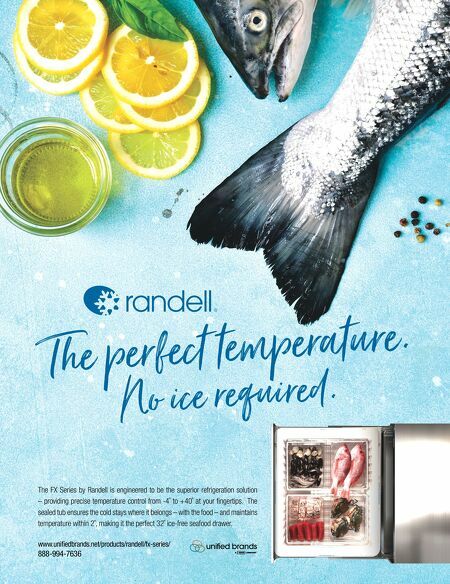 Our cov- erage of some of the innovations shaping today's college and university foodservice industry begins on page 20. All of us at Zoomba Group (smiling faces below) truly appreciate the opportu- nity to be associated with these industry awards and the generous support of our growing list of sponsor companies. All the best, Maureen M. Slocum, Publisher The FE&S team: Nicholas, Rebecca, Joe, Amelia, Patty, Donna, Anne, Tracy, BG, Samantha, Dave, Maureen, Renee, Kris, Carol, Kevin and Eric (kneeling).